The enchanting Villa Elize is a refined combination between subtle luxury and natural simplicity that can be seen from its evergreen garden to its natural stone elements. 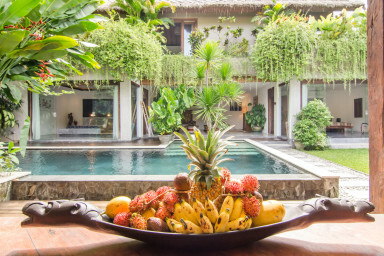 A spacious living room and dining area overlooking the private swimming pool and lush garden vibrates the calming atmosphere that you can find in this three bedrooms vacation rental. With only 500m to Batu Beliq Beach and many local eateries, our friendly staff will also be happy to assist you who desire home-cook meals with just the cost of groceries.